The main features of the 9th Round: the leader is caught, and the super-solid Bacrot wins his first game. 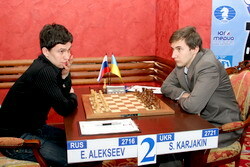 Alekseev defeated Karjakin with surprising ease, and now shares the first place with Aronian, who made another draw. 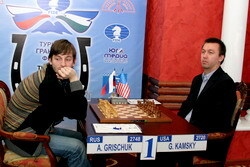 Grischuk played an epic game against Kamsky, missed a real chance to take the lead and even lost in the end. 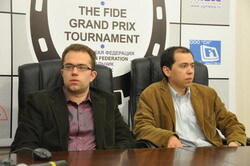 And the most important thing is that the players (and the commentators!) survived to the second free day! The fortune paid Kamsky back for everything he lost earlier. He survived all the troubles imaginable in a single game and nevertheless won it – just like he did in his early years. The turning point occurred between 53rd and 55th move. Clearly Alexander only considered ‘all-or-nothing’ moves, so he jumped right into deadly complications while he could slowly improve his position, retaining all its advantages. White could get a decisive edge by 53.Qd1! On the next move 54.Qd1! would give him a small plus, and 55.Qe6+! could secure an equal game. All these chances were missed, and Black ended up with a healthy extra piece. 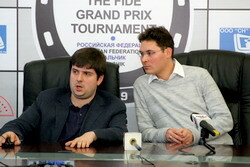 Kamsky’s play in the third time trouble was also far from perfect. For instance, it would be very difficult to win for Black after 69.Ne6+! Kh7 70.Kh1!! However, this chance was really a fluke – a usual time trouble occurrence. The lengthy queen’s ending developed logically. Black was winning, and he won. Finally a happy hour for Bacrot! He punished the aggressive opponent for neglecting basic chess principles. Shakhriyar wanted to win too much, and got carried away. Black’s problems began with 14…dxc4. 14…Bb7 looked much more natural. After White installed his bishop to h6, Shakh had to drive it away and castle as soon as possible. The natural 16…Bf8 would give him a chance for equality. However, the ambitious young grandmaster wanted more. He grabbed another pawn, after which White started a devastating attack. The final combination (28.Rxd7!) logically concluded Bacrot’s preceding play. Overall, this game is more fitting to the 19th century. Svidler did not win this game because he trusted his opponent too much! A very wrong attitude! One has to question the opponent’s decisions, even if the opponent is titled and well-reputed. Sometimes they also make mistakes. The namesakes played a fashionable line of the Ruy Lopez. White created pressure, Black defended accurately. The critical moment occurred unexpectedly. Leko carelessly ignored White’s powerful e5-bishop, although he could drive it away by 26…f6! And then Svidler made a mistake by not calculating 27.Bxg7+! The analysis shows that it wins: 27…Kxg7 28.Qe5+! (wrong is 28.Nxf5+? Kh8!) 28…Kg8 (also sad are 28…f6 29.Ne6+ Kg8 30.Qg3+ and 28…Kg6 29.Qg3+ Kf6 30.Re4!) 29.Nf5 f6 30.Qg3+ Kh8 31.Re7! Qxe7 32.Nxe7 Nxe7 33.Qc7!, and White has a decisive material advantage. This line is hardly a rocket science for the five-time Russian champion, but he simply did not believe in this opportunity! After White missed his chance, the game was simplified and drawn. An excellent game with many fine positional nuances. After a fierce opening battle the players traded the queens and started to fight for the critical squares, sitting behind the pawn chains. 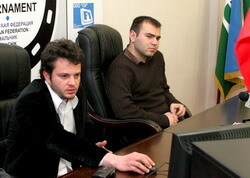 After the careless 20.Be5 Rustam could develop the initiative with the spectacular 20…f4!, but didn’t notice it. Black’s position became difficult, which could be underscored by the 25.b3! break. However, Pavel hesitated, and allowed the opponent to get his pawn to b3, which gave Black a strategic advantage on the queenside. The resulting position was balanced. 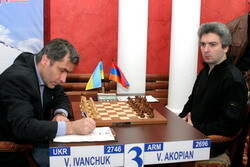 However, Kasimdzhanov showed more determination and great skill. His refined maneuvers and nice sacrifices (45…f5!, 52…Ng6!) changed the situation in Black’s favor. The victory was within on move: after 60…Bg2! White’s pawns would serve as a dinner for Black’s rook. But the tired player made a mistake, allowing his opponent to save the game by 61.Bxc4!